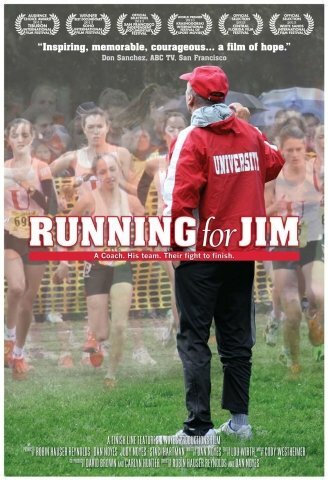 Running for Jim is a portrayal of grit, determination, and the powerful will to finish. The film chronicles the story of Jim Tracy, the deeply dedicated, brutally honest and tough-love coach of the San Francisco University High School cross-country team. Under Jim's leadership, the University High School girls' cross-country team holds a record nine state championships, making Jim the most decorated high school cross-country coach in California history. In June 2010, Jim Tracy was diagnosed with fatal Lou Gehrig's disease. Sixteen-year-old Holland Reynolds and her cross-country teammates brought Jim's story to international attention. On November 27, 2010, at the California State Division 5 Cross-Country Championship race, Holland "hit the wall" and collapsed several meters from the finish line. With a record-breaking state championship at stake, Holland, suffering from dehydration and hypothermia, crawled across the finish line, securing the record-breaking championship for her team and ailing coach. For the previous 17 years, despite being at times penniless and homeless, Jim committed his time and energy to training teens to run. Now, as Jim faces the challenge of his life battling ALS, he poignantly personifies the strength and fortitude he unequivocally demands of his athletes.